Anoint your bird garden with color and style by placing this Heartwood Yellow LanceLoft Bird House in it. The curved shape, cypress construction, and bright color scheme of this home add a fun hint to your setting, while providing small songbirds a fantastic roosting spot. The bold yellow body of this home is sure to capture attention, while an inset, turquoise door shape contrasts the body and creates a focal point. A verdigris colored, copper roof completes the shelter, and its arched shape evokes the round table to further the theme. Wrens or chickadees can easily enter the home through the 1.25" diameter opening on the inset door, and the deep body provides them plenty of nesting area. Ventilation gaps ensure nestlings remain comfortable, and drainage on the base helps the nest stay dry. Place this shelter against a wall or on a post using its attached, back hanger, and remove the back panel for cleaning or nest checks. The cypress body remains durable and colorful, with its lightly painted stripes offering an aged look, and the verdigris roof brings rustic style. 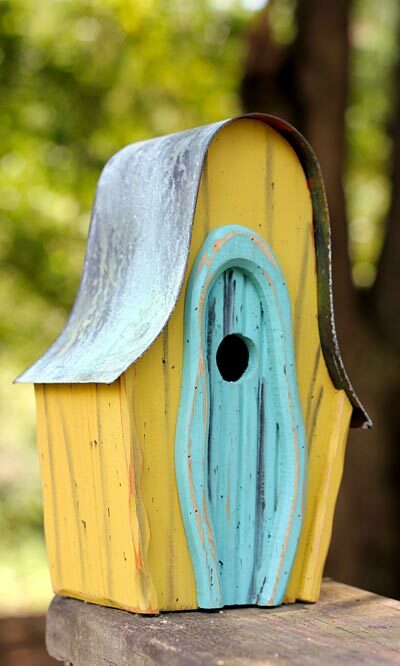 Enjoy watching birds fly around your garden and roost in this Yellow LanceLoft Bird House. Made in USA.